Leashed German Shepherd is aggressive toward other dogs. My one year old neutered male German Sheperd goes to doggy daycare and does fine. However, coming in to daycare or leaving daycare, leashed, he will go after other dogs. How can I stop this behavior? Total German Shepherd:I can tell you in one word - Training, Training, Training. (Well, maybe 3 words - but you get my meaning). Your GSD may be even sensing you getting anxious as you arrive or leave at the daycare, causing it to react this way. 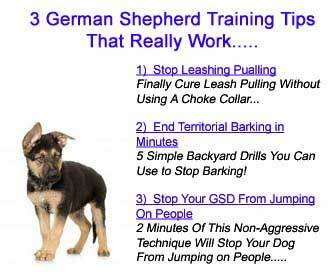 It's hard to say without exactly seeing what is going on in person but I would definitely encourage you to sign you and your German Shepherd up for a dog training class. That way you can work on this issue and learn how to prevent other behavioral issues in the future too. I would talk to the people who run your doggie daycare too - maybe they can help you work out a solution with less drama for when you pick up or leave your GSD. And if you want to check into a good dog training program that you can get online feel free to chick out either of the dog training banners on this page to learn more! Good luck! 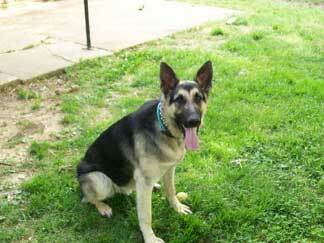 Comments for Leashed German Shepherd is aggressive toward other dogs. This is interesting to me, because my dog ALSO does great at daycare; we started taking him there to help socialize him. But in our neighborhood, we have barking, lunging and so forth, and I am very concerned because I get worried that he might get away from me when he does that. If anyone has any particular training methods, please let me know. When we go to obedience training, he's fine there, too. Good luck to my fellow GSD owner. Thank you!!! We have gone back to training.